Why Do I Need GRAMS? The GRAMS 9.2 Spectroscopy Software Suite is the premier solution for visualising, processing and managing spectroscopy data offering broad compatibility with many different instrument data types and a simple user interface. Thousands of life and analytical science researchers rely on GRAMS powerful collection of processing routines to solve some of their most difficult data analysis problems. The GRAMS Suite improves access to data and facilitates collaboration while reducing the need for multiple software packages and associated training. The GRAMS Suite provides a broad collection of tools to meet the needs of scientists engaged in a wide variety of spectroscopic experiments and disciplines. 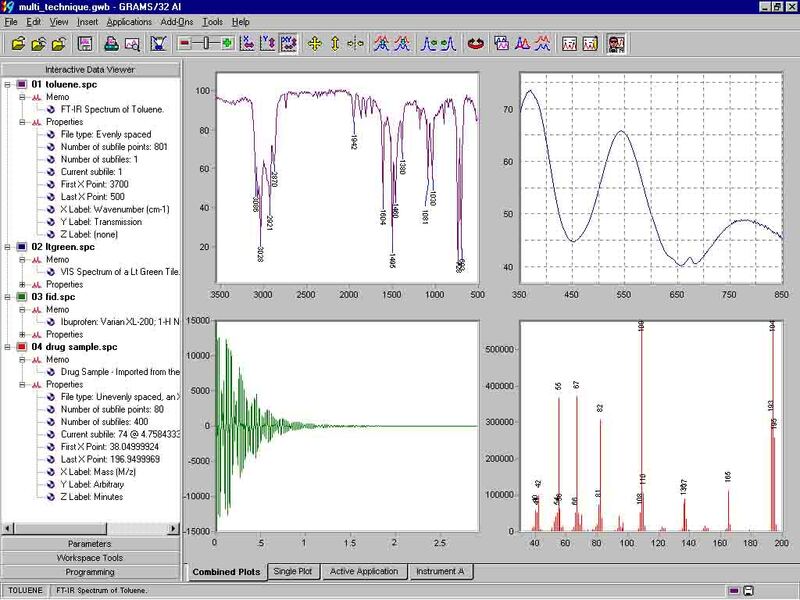 The GRAMS Suite is comprised of a set of complementary and fully integrated applications and modules centered on the core GRAMS/AI spectroscopy data processing and reporting software. Using the unique SmartConvert technology all GRAMS Suite applications are compatible with data files from hundreds of different instrument control applications including Agilent/HP, Beckman, Bio-Rad, Bruker, Gilson, Hitachi, PerkinElmer, Shimadzu, Varian, Waters/Micromass. The GRAMS Suite also supports a number of general-purpose data formats such as SPC, ASCII, JCAMP, and AnDI/NetCDF. For storing data, the GRAMS Suite utilizes the universal SPC file format enabling scientists to share data with colleagues easily and analyze it at their desks rather than occupying valuable instrument workstations. Complete information and a list of supported data file formats is available in the downloadable GRAMS Suite Brochure. We offer Special Academic Pricing on the GRAMS Suite for valid academic organizations. You can also download the GRAMS trial version and check out all the features yourself! 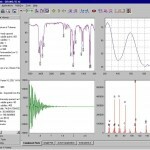 The core application of the GRAMS Suite, GRAMS/AI is a comprehensive processing, visualization and reporting package for data from many types of spectroscopic instruments as well as hyphenated techniques. Its advanced processing routines, data comparison and visualization features and its ability to handle data from virtually any analytical instrument data station have set the industry standard in scientific software. GRAMS IQ is a graphical multivariate analysis tool for building quantitative calibrations as well as qualitative models for discriminant analysis. In fact qualitative and quantitative methods can be linked together to provide a complete spectroscopic model of your samples. This software product is the complete solution for analysts looking to apply chemometric calibrations in the laboratory and on the production line. A new tool included with GRAMS, Envision is a multi-format Microsoft® .NET instrument data viewer with the capacity to host plug-in processing and reporting modules. Envision enhances GRAMS Smart Convert technology with more than 20 new instrument converters. It also offers support of the GAML open standard XML instrument data format. GAML allows capture of more comprehensive instrument meta-data and simplifies integration with LIMS, eLN and desktop applications. A run-time version of Inform, a drag-and-drop report designer built to complement GRAMS Envision, is included as part of Envision. As scientists work with increasingly large amounts of instrument data, keeping track of their samples and experiments is becoming more and more difficult. Often, researchers find themselves dealing with more information than they can effectively manage. Spectral DB provides a data management tool scalable from the desktop to the enterprise for organizing spectra and chromatograms into a simple, searchable database. Spectral DB supports Oracle, MS SQL Server and Access database formats. Spectral pattern matching or “library searching” is one of the most efficient, effective methods for qualitative identification of compounds, and Spectral ID is the most comprehensive searching software available. Fast and easy to use, it includes algorithms for materials identification using Mass Spectrometry, IR, Raman, UV-Vis, Fluorescence or NIR data. Spectral ID is compatible with spectral libraries from Chemical Concepts, NIST, Wiley, and Thermo which can be combined with user-built collections. Unlike static 3D plotting and rendering packages, GRAMS/3D is a true real-time visualization software application that offers scientists an interactive tool to view all the information in multidimensional data sets such as GC-IR, LC-PDA, multidimensional spectroscopy, 2D-NMR, 2D-IR, or spectroscopic mapping experiments. Multivariate data analysis methods have become common tools in applying modern spectroscopic instruments to solve qualitative and quantitative analysis problems. Chemometric techniques such as PLS, PCR, PCA and discriminant analysis have become standard approaches to quickly analyzing complex samples from their spectral signatures. Stand alone GRAMS IQ extends GRAMS/AI’s capabilities with an easy to follow, step-by-step graphical user interface for creating and deploying chemometric calibration models for the laboratory and the production line. The separate IQ Predict module can be used to deploy GRAMS IQ calibrations in a “predict-only” mode to multiple GRAMS/AI users. GRAMS IQ maintains compatibility with PLSPlus/IQ data files. In situations with relatively simple samples, multivariate calibration methods like PLS are often too complex and unnecessary. The QuickQuant module for GRAMS/AI offers a simple least squares regression calibration method for spectral data. The ExcelExchange module allows seamless transfer of data between GRAMS/AI spectral data files and Microsoft Excel worksheets. Data can be easily transferred in both directions: from a GRAMS data file into an Excel worksheet and from a worksheet to a data file. GRAMS convert intelligently scans multiple directories converting known file formats into the industry standard GRAMS .SPC format.